National Safe Boating Week kicks off next week and the public is invited to test ride a Sea-Doo watercraft at one of our Test Ride Events. BRP Sea-Doo is offering consumers the opportunity to test ride the new 2013 Sea-Doo watercraft, equipped with iBR, the world’s only on-water brake system at Test Ride events across the United States this spring and summer. The 2013 Sea-Doo Test Ride Tour will be visiting 23 popular family boating destinations and the next stops are in Long Beach, Calif., and Gainesville, Ga. National Safe Boating Week is May 18-24 and BRP’s Intelligent Brake and Reverse (iBR) offers more technologies, more control and more safety. In 2009, BRP received a Boating Safety Award from the United States Coast Guard office of Auxillary and Boating Safety for their commitment to improving boating safety with the introduction of the industry’s first, and only, electronically controlled hand-braking and reverse system, the iBR™ (intelligent Brake and Reverse), on two of its Sea-Doo watercraft models. Sea-Doo remains the only manufacturer to offer this on-water braking system and it is now a standard feature in every 2013 Sea-Doo watercraft category. The Sea-Doo Test Ride events will be free to the boating public. * Each Sea-Doo Tour STOP is designed for both experienced and first time boating families to experience the Sea-Doo lifestyle in a casual, fun filled atmosphere. Consumers are encouraged to visit http://www.seadoodemo.com to pre-register for the event and request a custom time block on the day of their choice. 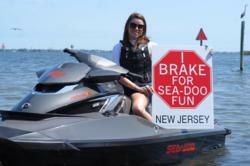 When: The Sea-Doo “I Brake For…” Test Ride Tours will be held Friday May 10, 1-5 p.m., and Saturday and Sunday, May 11-12, from 10:00 a.m. to 5:00 p.m. Details: Visit http://www.seadoodemo.com or http://www.facebook.com/seadoo for the most up-to-date information regarding the Sea-Doo “I Brake For…” Test Ride Tour events and everything Sea-Doo. For a look at the new Sea-Doo watercraft, visit http://www.sea-doo.com.